Comet Lovejoy C/2013 R1 on November 13, 2013. Victor Rogus is an amateur astronomer, and this is the sixth in his series of exclusive Space.com posts about amateur astronomy. He contributed this article to Space.com's Expert Voices: Op-Ed & Insights. On September 7, 2013, Australian Terry Lovejoy — using an 8-inch Schmidt-Cassegrain telescope — discovered what would be designated comet Lovejoy. During October, the comet moved into the Northern hemisphere at a time of great excitement for comets in general, as the stargazing community waited for "The Comet of the Century": the sun-grazing comet, ISON . My own early attempts at seeing comet ISON were disappointing at best. Weather and ISON's dimness left me frustrated and I decided to seek better, brighter game. Comet Hale-Bopp on March 31, 1997. That period reminded me of a time long ago when the world waited for the arrival of mighty comet Hale-Bopp C/1995 O1. Many of us looked forward to Hale-Bopp's entrance onto the cosmic stage with great anticipation, when suddenly, nearly a year before its arrival, it was upstaged from out of nowhere by the majestic comet, Hyakutake. Comet Hyakutake taught me just how little we humans knew about the universe around us. I remember those days, sketching a star chart showing where to look for comet Hyakutake , then throwing it on the ground as I stepped out of my pickup truck at my dark sky site in Algoma, Wisc. I stood there staring at the amazing specter of Hyakutake's tail stretching across the entire darkening sky. It was then that I asked myself, "How did we not see this coming?" Our science is great, but people should be humbled that we did not see this one coming — be wary of pride. Comet Hyakutake on March 21, 1996. To me, comet Lovejoy seemed Heaven sent. Brightening rapidly and well placed for photography in November last year, it swiftly captured my attention. November 13, 2013, promised clear but cold skies near my home in Jadwin, Mo., when I would make my first attempt to see and photograph Lovejoy. The weather, thus far, had been typical November: cloudy, rainy and cold. But that night held promise. I remember feeling glad that I had an opportunity like this, a near naked-eye comet and clearing skies. It would be an early morning comet, but that was a small sacrifice after years waiting for conditions like those. I was using an f9, 5-inch apochromatic refractor on which I had just replaced the focuser. This would be the test image for my newly modified telescope. As the night wore on, I scanned the skies with binoculars until the moment I made first contact with comet Lovejoy. Slewing my telescope (moving to aim at a point in the sky), I found the comet in a 2-inch-wide-angle eyepiece, one that gave me low power but a bright field of view. The eyepiece was a gift my mom had given me for my birthday the Christmas before (yes, I am indeed a Christmas baby). There I stood at the eyepiece, shivering not with cold but excitement. Behold a marvel in the darkness! "Calm down," I told myself aloud, "you have work to do." I then slipped the diagonal — a device that that makes it easier to use refracting telescopes when the eyepiece end of the telescope is uncomfortably low to the ground — and eyepiece out of the telescope's focuser, just then realizing how well the new focuser worked, and replaced it with a digital single-lens reflex (DSLR) camera, refocusing carefully on the faint glowing orb that was Lovejoy. Selecting ISO speeds and exposure lengths, gradually improving the image gave me great pleasure standing alone in the cold of my front yard. The sky here is very dark and is the reason I live in the backwoods of Jadwin. After a while, I knew I had captured my best image of the night. Comet Lovejoy C/2013 R1 on November 28, 2013. 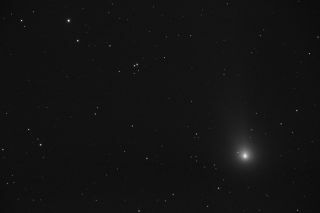 The passing of truly great comets is an extremely rare thing. It is my advice to the budding astrophotographer to never miss an opportunity to spend as much time as possible with these strange visitors from the distant Oort cloud. Do not take them for granted, they are ever-changing and hold surprises for us Earthly observers. Comet Lovejoy on November 30, 2013. Due to poor weather conditions, nearly two weeks had elapsed between my first and second attempt at documenting comet Lovejoy's passing. Only two days after my last outing with the beautiful comet, I had another chance. I had learned a lot from my previous outings, and liked what I had done so far. Now it was time for something different: I would image in color. I have always loved black and white photography. In my opinion, it gives the most honest rendition of a subject and no false-color issues — just a collection of grey tones and a sort of purity not found in other forms of photography. But comet Lovejoy displayed a beautiful color, a greenish glow that could not be ignored. I favor refractors, and the wind can cause them to jiggle and vibrate and cause them problems in general, more so than telescopes of other designs. That night was windy, and I tried to make my exposures that morning between the wind gusts. I would listen to the rustling of the pine trees: they would warn me when the wind would start to pick up and I would then end my exposure. Who needs a wind gauge when you have a pine tree? Comet Lovejoy C/2013 R1 and a "spark" of a meteor on December 12, 2013. If I braved the cold, as I had done so many nights before, perhaps it could be done in a wide-angle photograph — worth a try if I had some clear skies. Clear and cold was the forecast for that night, and I planned to set up a home-built camera tracker as near the house as I could. I would make exposures with a 35mm Carl Zeiss manual focus lens, ducking inside regularly to warm up for a couple of minutes before setting out again. The comet was rather low in the east before dawn, and I realized I would have to make good use of my time if I was to capture the "sparking" phenomenon in Lovejoy's tail. As time dragged on and the bitter cold tried its best to discourage me, in my last exposure I seemed to capture one of those reported sparks. It was Geminid meteor season, and the spark might have been just that, but I have found from personal experience that meteor activity is often high when a comet is in the sky. And this small spark of a meteor was apparently close to comet Lovejoy's tail. A few hours later, I fell sound asleep dreaming that perhaps I had done what I had set out to do. I might never know for sure, but in my heart I thought maybe so. I like to think I did! The weather after that winter's night deteriorated rapidly into clouds and snow and those were to be my final hours spent with this beautiful comet. After a time one forgets the early mornings and the cold temperatures, but what does live on are the memories of the shimmering stars and the graceful comet with the beautiful name playing with meteors before the sunrise. Rogus' most recent Op-Ed was "As Saturn Slips Behind the Moon." The views expressed are those of the author and do not necessarily reflect the views of the publisher. This version of the article was originally published on Space.com.